Safe Books is our answer to an age-old question. 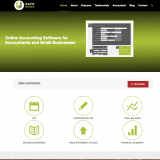 How can bookkeeping be made simple? It all started with a conversation between us and a client of ours; an accountant. Frustrated with the inefficiencies of bookkeeping for his clients, he needed a way to simplify the entire process. We listened to his problems, did the research, and created a solution. That solution is Safe Books.